Mike Pence was set up to fail. In other words, Pence entered the talks under no illusion that progress lay waiting. The result was that Pence’s negotiating partners saw him as a man sidelined, a status that has increasingly defined the vice president’s tenure, according to interviews with lawmakers, aides, and current and former administration officials, many of whom requested anonymity in order to speak frankly and reveal confidential details. In Sunday’s meeting, for example, Democratic staffers made clear that they would not negotiate border-wall funding until the government reopens, maintaining the position House Speaker Nancy Pelosi had staked out days before. According to two congressional staffers in the room, Pence responded by discussing funding for border-security items both parties might agree upon, such as drone technology. For Pence, the sources said, it appeared an attempt to maintain a smooth and congenial discussion. Nevertheless, with regard to the sticking point—$5.7 billion for a wall—both parties remained dug in. “I wish he’d been a bit more forceful,” lamented one Republican aide who was in the room. Pence has never been an outwardly aggressive negotiator on behalf of the president, preferring to project a calm, respectful, and reasonable demeanor to contrast Donald Trump’s bombast. It’s a posture that most lawmakers and aides I spoke to appreciated, praising Pence as a valuable sounding board for their frustrations with the White House, notably at Senate Republicans’ weekly policy lunches, which he attends frequently. Yet when it comes to reaching a deal with Democrats to reopen the government, it has mattered almost none: On Monday, day 17 of the partial government shutdown, the White House announced its most serious threat yet to declare a national state of emergency over what it claims is a crisis at the U.S.-Mexico border. Should the administration declare a state of emergency, Pence’s reputation as a mediator between the White House and Congress would likely take a hit. Such a declaration would symbolize the administration’s failure not only to pick off Democrats, but also to maintain the total support of its own party: In the past week, moderate Senate Republicans such as Susan Collins of Maine, Cory Gardner of Colorado, and Thom Tillis of North Carolina said they were prepared to back the government’s reopening with or without wall funding. According to multiple current and former administration officials, however, as Trump’s friction with Congress has increased, Pence’s clout has suffered. 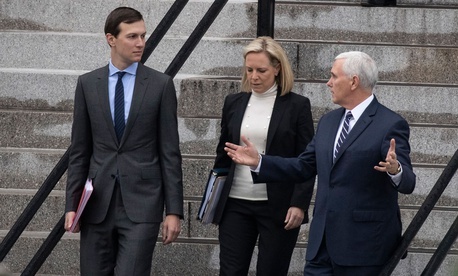 Two sources, one close to the vice president and the other close to the president, both of whom requested anonymity in order to discuss internal conversations, affirmed to me that Pence was leading the Trump administration’s negotiations on border security. Yet the fact remains that this weekend, the president gave his lead negotiator very little room to negotiate, sending Pence to a meeting that Trump himself said would yield nothing. This, coupled with the moments over the past month when Trump has publicly undermined Pence’s messaging, has helped create a portrait of a vice president with diminishing influence. A meeting on Wednesday of top White House officials and congressional leadership in the Situation Room illustrated this well. At one point, according to a source familiar with the matter, Pence claimed that Schumer never responded to the White House’s downsized request for border-wall funding. Schumer responded that it was hard for him to take the figure seriously. He noted that at the same time Pence made the ask, two Saturdays before, a senior administrative official holding a background briefing call with reporters said the president would accept no less than $5 billion. Even the president had said that day that he would only accept $5.6 billion, Schumer noted. “Didn’t you, Mr. President?” he asked, according to the source. “The president, with his arms folded, smirked and nodded,” the source said. The exchange represented another swipe at Pence’s credibility, with the president declining to defend his vice president’s motives in front of Democratic leadership. “If you were Nancy or Chuck, why would you spend time cutting a deal that may be dismissed out of hand by the ultimate decider?” one former senior White House official said. Lawmakers and aides I spoke to sympathized with Pence’s position. According to one veteran House Republican aide, it was almost always a “given” that when former Vice President Joe Biden communicated the White House’s agenda to the Hill, Barack Obama would be quick to follow through. Conversely, when Pence communicates the president’s position, “it ends up being accurate maybe 50 percent of the time.” When a president deals more in “spontaneity” than in specificity, the aide added, legislative talks are bound to break down. Representative Mark Walker, the House Republican policy vice chair, echoed that sentiment: “The more specificity you have, the better you can negotiate. Pence’s ability to steer Trump toward compromise will be tested even more in the months to come, as House Democrats settle into the majority. For the first time in this presidency, the success of Trump’s legislative ambitions will hinge almost entirely on Democratic buy-in. True or not, it’s an impression that Pence doesn’t seem to mind. As with many White House officials, Pence’s favor with Trump—and with many of his voters—will likely depend more on loyalty than accomplishment.